During his lifetime Johann Sebastian Bach was better known as a virtuoso organist, harpsichordist and organ builder than as a composer. It wasn’t until the 19th century that the world began popularizing his work and building his reputation as one of the greatest composers of all time. J.S. 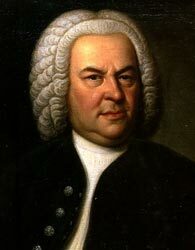 Bach was born March 21, 1685, in Eisenach, Thuringia to Johann Ambrosius Bach and Elisabeth Lämmerhirt. He came from a large family of musicians on both parents’ sides. While little is known of Johann Sebastian’s musical education, he was undoubtedly a good student. By 1695, his parents were dead, and the young Johann Sebastian went to live with his older brother, Johann Cristoph, an organist taught by composer Johann Pachelbel. It’s likely that his brother gave Johann Sebastian his first formal music lessons. With a strong performance in school and a good singing voice, Johann Sebastian earned a place in a “poor boys” choir in 1700. By 1702, Bach had become a fairly accomplished organist, gaining experience that directed him away from the string-playing history of his immediate family. He was appointed organist for the New Church in Arnstadt, Germany, around August 1703. The young Bach’s music had a powerful German influence, but he was also exposed to Italian music, particularly the work of Antonio Vivaldi. His style evolved to embrace both the German and Italian backgrounds. For a large part of his career, Bach was an organist. In 1703, he began playing at the St. Boniface Church. While there, he decided to make a nearly 200-mile journey on foot to listen to the famed organist Dietrich Buxtehude. He meant to leave his post at St. Boniface Church for only a month, but he ended up staying away for five months and took another job as organist at Mülhausen for a year, then worked as an organist and concertmaster for the court of the Duke of Weimar. Bach was married twice, first to Maria Barbara Bach, who died, and to Anna Magdalena Wülken. He fathered 20 children (only 10 survived past infancy), and a few went on to become accomplished musicians as well. Bach was buried in an unmarked grave at St. Thomas Church. In the view of scholars, Bach’s death marks the end of the Baroque period of music. This article was originally written by Lindsey Chapman; it was updated February 3, 2017.